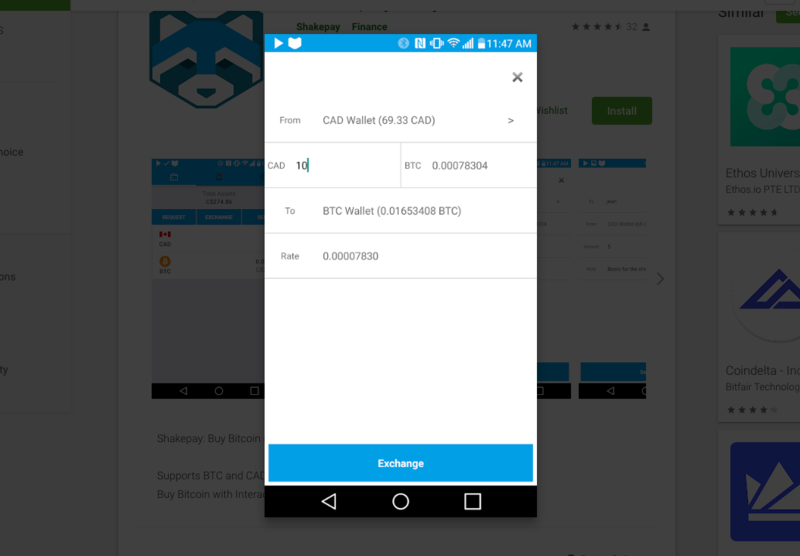 Shakepay is a mobile crypto exchange and peer-to-peer wallet that is only available in Canada. Low fees, fast transactions and an easy-to-use interface have made the Shakepay app popular among its early users. But is it right for you? Our Shakepay review will tell you everything you need to know. Shakepay covers mining fees on ether and bitcoin withdrawals. Transaction fee of 0.75% is high, though offset by zero fees elsewhere. What Can You Trade on Shakepay? Shakepay’s first incarnation was as a bitcoin prepaid card and payment service. The company rolled out an invite-only alpha program in March 2016. Customers could order plastic or virtual prepaid cards that automatically converted their bitcoin holdings into local fiat at the time of purchase. Mobile apps provided the same service at tap-to-pay terminals. By October, Shakepay development rolled out its beta phase as well as the Shakepay mascot, a red panda (which happened to be blue). Three months later, in January 2018, Shakepay had to cut off all its customers. The company fell foul of credit card issuer Wavecrest’s troubles with Visa. This is the same issue that hit almost every other company around the world offering bitcoin prepaid cards. 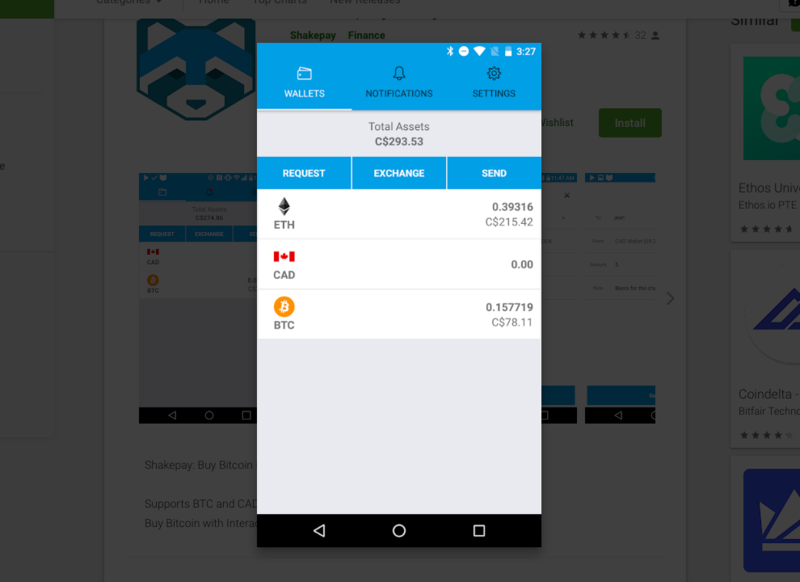 In February 2018, Shakepay emerged from the ashes along with its (blue) red panda. 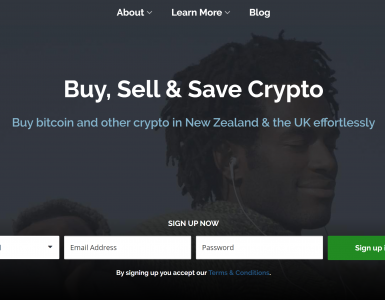 Starting out as a beta program, the new service delivered a bitcoin exchange service and peer-to-peer wallet through new mobile apps. 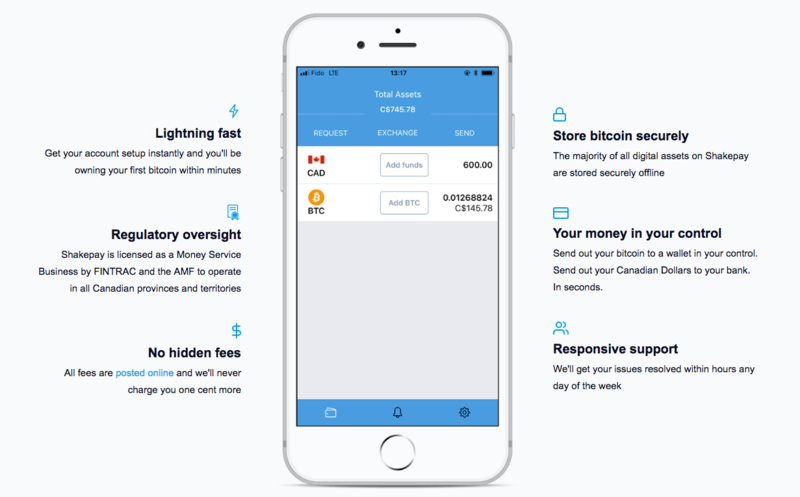 “Shakepay is the fastest way for Canadians to buy and sell digital currencies directly from their mobile phones,” Shakepay CEO Jean Amiouny said in the press release. Shakepay’s co-founders, CEO Jean Amiouny and CTO Roy Breidi, guided the company through its rise, fall and rise again. Both attended McGill University. Shakepay’s major investors are Silicon Valley-based Boost VC, China’s Amphora Capital and Toronto’s Creative Destruction Lab. Shakepay has received a license as a Money Service Business from Financial Transactions and Reports Analysis Centre of Canada (FINTRAC). As a result, the company must verify its customers to comply with anti-money-laundering (AML) and know-your-customer (KYC) regulations. In a Reddit post announcing the new service, Shakepay explained that it has partnered with a Schedule 1 bank. The term “partner” may mean the company is working with one of the few bitcoin-friendly Canadian banks. If so, Shakepay is on firmer ground than many other crypto companies in the country. Shakepay has not revealed what it takes for other coins to become part of the service. At first, Shakepay was only a bitcoin service. 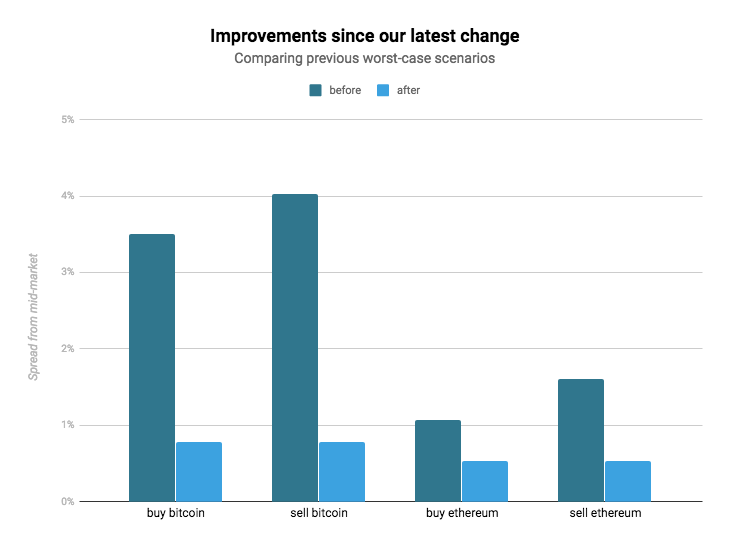 The company did not dive into its rationale when it added support for Ethereum at the end of July. Because Shakepay is a custodial service, it has to hold its customers’ assets in a mix of hot and cold wallets. All Shakepay says is that “the vast majority” of the assets are in offline cold wallets. All communication between the apps and Shakepay’s servers are made through Secure Socket Layer connections. The servers themselves use AES-256 to encrypt customer data. Shakepay has a support site, although the content is limited. 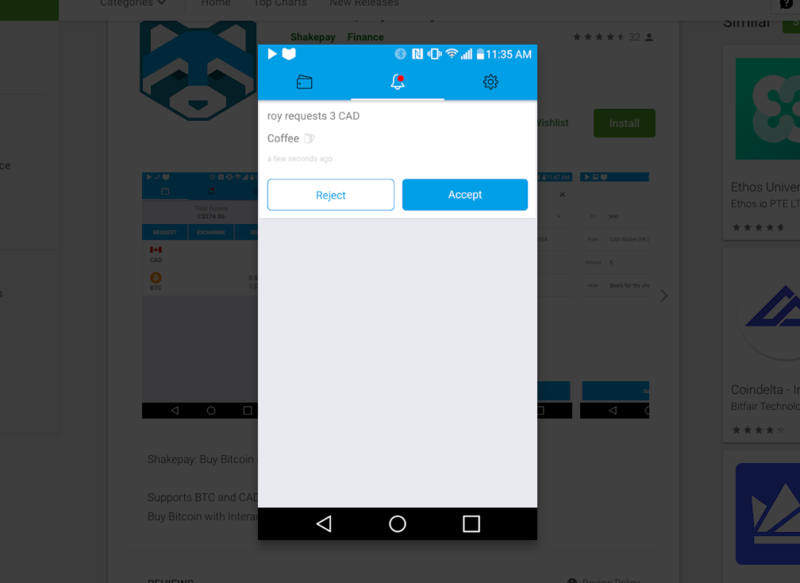 Support is also available through Shakepay’s mobile apps. Reaction to Shakepay on the forums has been positive. Redditors liked the service and described the experience with words like “seamless” and “fast” and “very happy”. Shakepay went on to explain that, given the low liquidity of bitcoin/Canadian dollar trading, the spreads of 7% are inevitable. The company is developing systems to do the trades on BTC/USD markets which will bring the spreads down. Only Canadian residents can use Shakepay. When customers first sign up with Shakepay, they go through an instant verification process. Name, address and date of birth are all that’s needed for Shakepay’s verification provider to confirm customers’ identity from their credit scores. If for some reason the instant verification does not work, then customers must go through a more traditional verification process. Customers must provide an e-bill from a utility company or a benefits statement. They must also provide an e-bill from a credit card company, bank or mortgage provider. Scans or photos won’t work, these have to be PDF downloads. Finally, the customer must provide a selfie holding their government-issued ID. Shakepay does not promote the option for businesses accounts, either on their webpage or on their service and support site. However, after this review was published, a Shakepay representative reached out to clarify that business can sign up with the exchange. If you represent a business that wishes to join the exchange, you must contact Shakepay directly to find out how to apply and go through the unspecified business verification process. Originally just a bitcoin service, Shakepay just added support for ether. 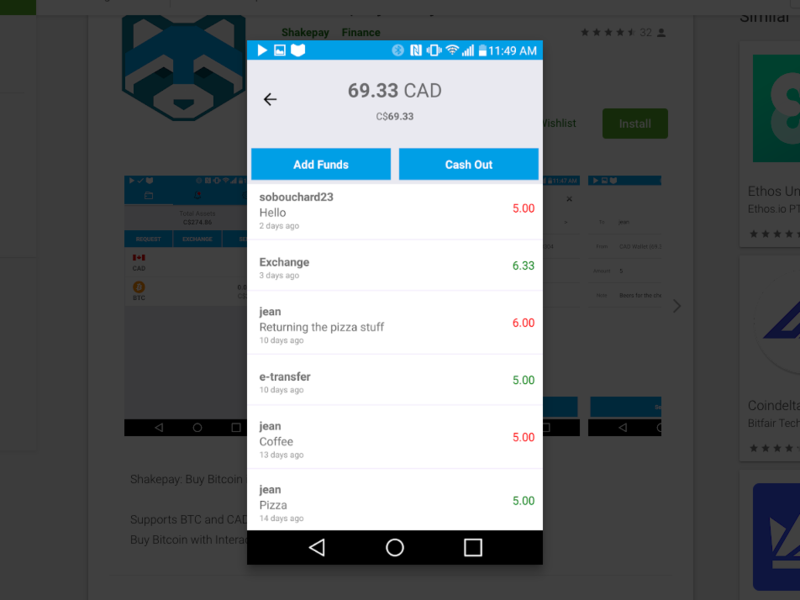 Shakepay only supports Canadian dollars. Shakepay customers can exchange bitcoin and dollars as well as ether and dollars. You cannot exchange bitcoin and ether. 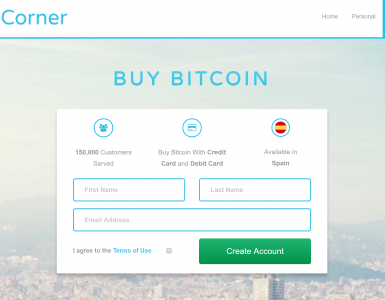 The app also lets Shakepay users send bitcoin, ether or dollars to each other. There are no advanced trading options. The Shakepay app has a clean, easy-to-navigate interface. It opens with a summary of your holdings. 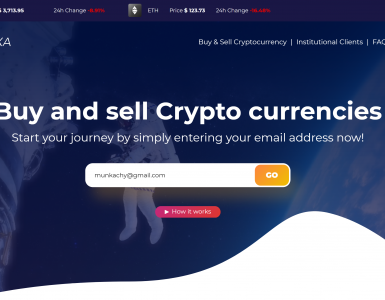 The exchange interface is just as simple. Shakepay finds the best market rates behind the scenes so all you have to do is enter the amount of dollars you want to spend. Shakepay users can transfer bitcoin, ether and dollars. A history of all of your transactions is available in the app — a handy feature for tax time. Shakepay is only available as mobile apps for Android and iOS. The Android app has a 4.5-star average rating with overwhelmingly positive reviews from three dozen users. Customers respond in particular to the app’s ease of use and Shakepay’s low fees. The iPhone app had not received enough reviews to get a rating when this review first appeared. Since then, 22 people have given the app an average 4.4-star rating. You can deposit dollars into the Shakepay wallet or withdraw dollars to a bank account by using Interac transfers. The nature of the Interac system means the transfers could take an hour to complete. Wire transfers are also possible. The Shakepay apps are digital crypto wallets and work just like any bitcoin wallet for deposits and withdrawals. The ether wallet also supports deposits and withdrawals. Shakepay charges a 0.75% fee whenever you buy or sell bitcoin or ether. This is higher than most other exchanges, but partially offset by the absence of fees on deposits and withdrawals. All deposit and withdrawal methods for both fiat and cryptocurrencies are free of fees. Shakepay even covers the mining fees for bitcoin withdrawals and the gas fees for ether withdrawals. When this review first appeared, Shakepay charged a $20 fee on wire transfer deposits and withdrawals less than $10,000. Shakepay has since eliminated the fee and set a minimum transaction size of $1,000 on wire transfer deposits. An electronic deposit via Interac is possible for transactions as small as $5, but daily limits of $1,000 (Interac Online) and $10,000 (Interac eTransfer) will apply. Shakepay had already built a lot of goodwill with its prepaid card business and that carried over to its relaunch. 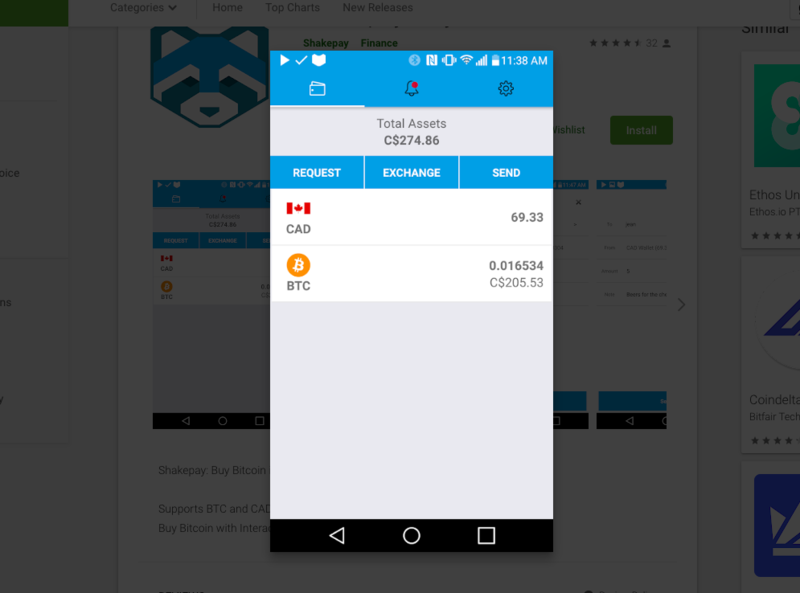 Canadians who want a fast, easy and affordable way to buy bitcoins or ether with their dollars will find a lot of reasons to migrate from Coinsquare and QuadrigaCX. Shakepay provides a low-stress way for people new to the scene to make their first bitcoin and ether purchases. The app’s simple interface and quick currency transfers make Shakepay a good first choice. Shakepay isn’t trying to be an advanced crypto service. All the same, experienced crypto traders may find the simple, well-executed app serves a purpose as their daily bitcoin and ether wallet. Update: in late 2018, Shakepay reduced its trading fees from 1.75% to 0.75%. Update: Shakepay recently added support for ether and addressed customer concerns about the spreads between buy and sell exchange rates. The article has been updated with this new information. Update2: Clarified peer-to-peer function, updated reduction of spreads, updated iOS reviews, updated elimination of wire transfer fees. Update3: Shakepay reached out to explain that business accounts are possible, just not actively promoted on the Shakepay website or the support site. Also added the mininum deposit requirement for Interac electronic transfers, as well as the fact that ether deposits are now supported.